Thirsty Pilgrim: Me, Rad Brad, and Good Beer in Springfield, Mo. Hi. 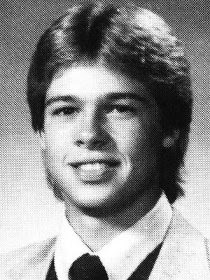 I'm from Springfield, Missouri, hometown of Brad Pitt. Now, I know what you're thinking. For a town like that to produce someone like Brad Pitt and someone like me... "Well," you're saying to yourself, "there must be something real special in the water down there." And maybe there is. 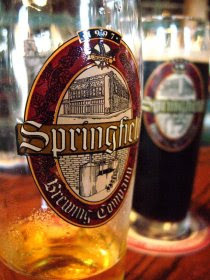 Being from Springfield, the Springfield Brewing Co. is our hometown brewery. I'm proud of that. Most beer geeks have never heard of the place. I don't care. Truth is, it's a lot like thousands of other breweries across the country. It has a shiny brewing kit and shiny dark wood on the bar. It has a mug club for regulars. It has bartenders who don't always know what they're talking about. It has a core of house beers and an always-changing range of interesting seasonals, usually served too cold. There are occasional appearances from a barrel-aged sour ale, a hop monster, and a coffee stout. That's about as wild as it gets. Nothing that really stands out from the pack. What sets it apart for me, besides the fact that it's my hometown brewery? This: I believe the technical quality is exceptionally high. In my 10 years of legal drinking, I've simply never had a bad beer there. From the light and refreshing quaffers on up to the ponderous Barrel Reserve, it all just tastes good. For me that puts it in the upper 10th percentile of all American breweries. You might have heard this pointless pub debate: What country is the best/most exciting/most innovative brewing country? There's no correct answer,* and it's usually an excuse for my fellow Americans to pat each other on the backs (which is lame). Or maybe just an excuse to argue (which I respect). Usually the argument brings up all the exciting experiments with alpha hops, wild yeasts and barrels, plus the ongoing efforts to preserve foreign beer styles that have gone extinct. Fine. The experiments are fun, but you know what's better? More and more small- and mid-sized cities having perfectly decent breweries of their own. One they can call their own. Imagine it! After decades of light lager then 30 or so years of craft beer revolutionizing, we're finally getting to a point where nearly every town bigger than a village has a local that makes its own beer. That's so, I don't know, German of us. Speaking of Germany, the Springfield brewery makes one of the best Schwarzbiers I've ever had. And I've had a lot of them. In Germany. It's not a style I get excited about, but this one just tastes good. Chalk it up to a high degree of technical skill if you want. Or maybe there's something in the water. *I'm lying to your face to make a point here. In fact the correct answer is Belgium. Agreed. There's a similar point to be made about real ale pubs in Britain, which is; would you rather have a few pubs that have loads of real ales, or would you rather that almost all pubs had a couple on in good condition? I'd go for the second, even if that meant I drank the same thing most nights.